Chemistry and physics are experimental sciences; and those who are engaged in attempting to enlarge the boundaries of science by experiment are generally unwilling to publish speculations; for they have learned, by long experience, that it is unsafe to anticipate events. It is true, they must make certain theories and hypotheses. They must form some kind of mental picture of the relations between the phenomena which they are trying to investigate, else their experiments would be made at random, and without connection. From 'Radium and Its Products', Harper’s Magazine (Dec 1904), 52. One of the earliest questions asked by an intelligent child is: “What is this made of?” “What is that made of?” And the answer is generally more or less satisfactory. For example, if the question relates to butter, the reply may be, “From cream.” It may be explained, besides, that when cream is beaten up, or churned, the butter separates, leaving skim-milk behind. But the question has not been answered. The child may ask, “Was the butter in the milk before it was churned? or has it been made out of the milk by the churning?” Possibly the person to whom the question is addressed may know that the milk contained the butter in the state of fine globules, and that the process of churning breaks up the globules, and causes them to stick together. The original question has not really been answered; and indeed it is not an easy one to reply to. Precisely such questions suggested themselves to the people of old, and they led to many speculations. Opening paragraph of Modern Chemistry (1900, rev. 1907), 1. 2 Oct - short biography, births, deaths and events on date of Ramsay's birth. 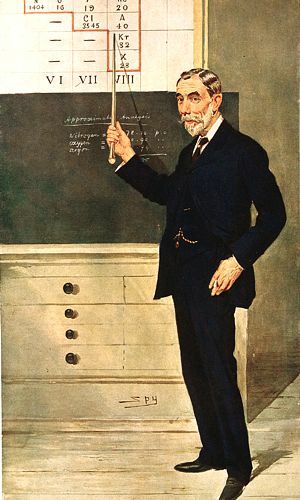 Radium and its Products - by William Ramsay in Harper’s Magazine (Dec 1904). Air: Scientific Discoveries and Inventions - from Haydn's Dictionary of Dates (1904). A Life of Sir William Ramsay, by Morris W. Travers. - book suggestion.